The Little Blog Dress: Victoria Fine Foods comes to Florida! Victoria Fine Foods comes to Florida! 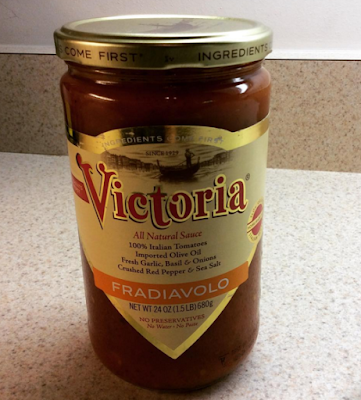 Victoria Fine Foods is an authentic pasta sauce manufacturer based in Brooklyn, New York. As you know, this is the holy land of all that is Italian. The company uses a slow, kettle-cooked approach to making their sauces, and they use fresh, real food/non-GMO ingredients that provide an authentic homemade sauce in convenient, ready-to-eat form. I am so excited that to announce that they are now in Florida! For a location near you, click here! As a self-proclaimed official tomato sauce tasting expert, I couldn't wait to try this especially when the ingredients were so fresh and the cooking process was so unique. I decided to give my Seafood Fradiavolo a whirl with their sauce! This is a very easy recipe perfect for busy holiday weekend nights, the sauce needs absolutely nothing but to be added to your favorite seafood (I chose shrimp, but crabmeat is divine!) and pasta. I got a great picture of the sauce so you can see how fresh the ingredients look! Toss with your favorite pasta and Heaven!